Batman stands vigilant beside the Bat-Signal, ready to defend your cell phone, keys, sunglasses, and wallet. 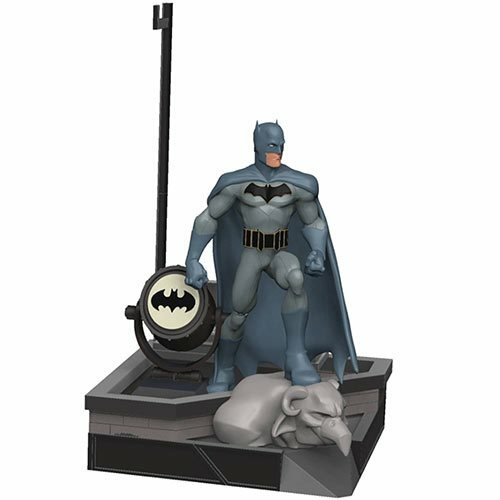 The remarkable DC Rebirth Batman Finders Keypers Statuette features a stand for your phone, a post for your glasses, and a place for your wallet… plus a removable key chain in the terrific diorama base! It measures about 5 1/2-inches tall x 5 1/2-inches square, not including the post. Finders Keypers give you a really cool place to store your keys. The plastic statues feature a removable key chain that nests in the base. Highly detailed, with exceptional attention to likeness and paint, it's hard to find something this awesome at this price… and they watch over your keys! Finders Keypers are perfect for display in your home or office. Batman Dark Knight Returns Tank Vehicle with Collector Mag.